Keeping the customer’s needs front and center is important when developing new digital tools. 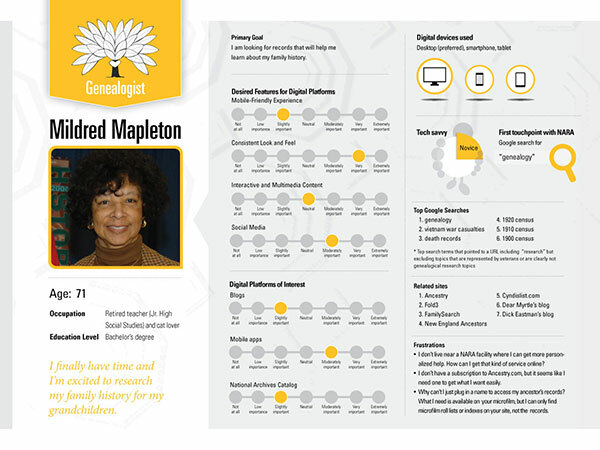 We recently developed a set of user personas as part of our work to establish a more robust—and data informed—understanding of the individuals that engage digitally with the National Archives (NARA). User personas are fictional, but realistic representations of key audience segments that are grounded in research and data. We recently applied customer data from a variety of sources including website analytics and online surveys to inform the creation of eight personas that represent our digital customers: Researchers, Veterans, Genealogists, Educators, History Enthusiasts, Curious Nerds, Museum Visitors, and Government Stakeholders. These personas not only help us capture knowledge about our customers and their needs and preferences, but also help NARA staff empathize with the individuals who use our services. User personas are often used by designers and developers to place the customer’s perspectives and needs at the center of the digital design and development process. When conducting research to develop the individual personas, we took an analytical approach using data from our web and social media analytics, our online customer satisfaction survey, and incoming emails from customers. Additionally, we interviewed NARA staff that often interact with the user types we were trying to understand, in order to get their insight and feedback. While fictional, these personas represent our major user groups and help us keep their needs and expectations at the forefront of our decision making. Each persona consists of two pages: the first page provides a snapshot of the user’s demographics and a quote to help bring the persona to life, while the second page provides user stories that help us to better understand how this audience interacts with NARA and why. Mildred, like all of our user personas, is not an actual person, but a realistic representation of one of NARA’s key audience segments. Her character is based on research and backed by evidence. Although the data gives us a good outline of who she is, the specifics you see here that make Mildred feel like a real, well-rounded person are semi-fictional and shaped by educated assumptions. These representations of our customers are based on quantitative data (e.g., metrics about web pages viewed, social media use) and qualitative user research (e.g., online surveys). It is very important to remember that a persona is a composite representation of the prevalent qualities of an audience segment and will not exactly match a specific person or comprehensively describe the full diversity of a group. 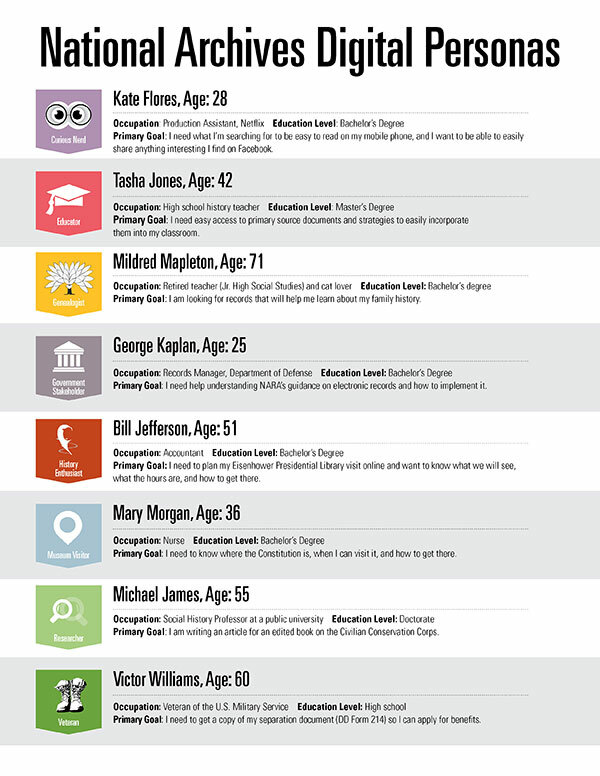 These personas will be used to improve NARA’s customers’ digital experience. The ultimate goal is that every time a project with a digital component is discussed at NARA, these personas will be used to inform decision making. By identifying the personas that we work with most often and referring to them when thinking about new and better ways to serve them, we can work to better inform and prioritize our work and better understand customer interactions across all of our digital properties. 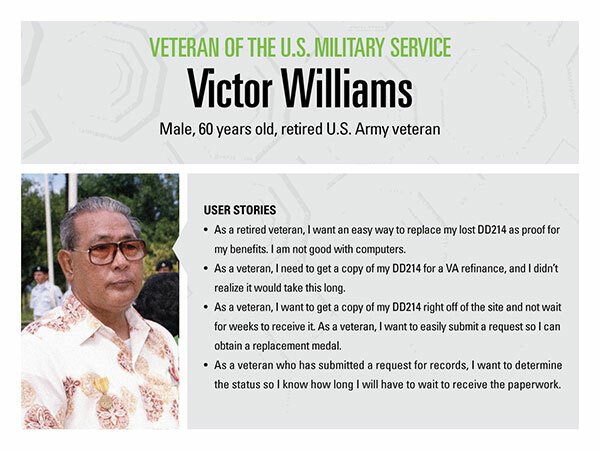 Learn more and meet the complete list of digital personas on archives.gov.This post was originally published on the blog of the Archivist of the United States (AOTUS).